Ice Cream Month. 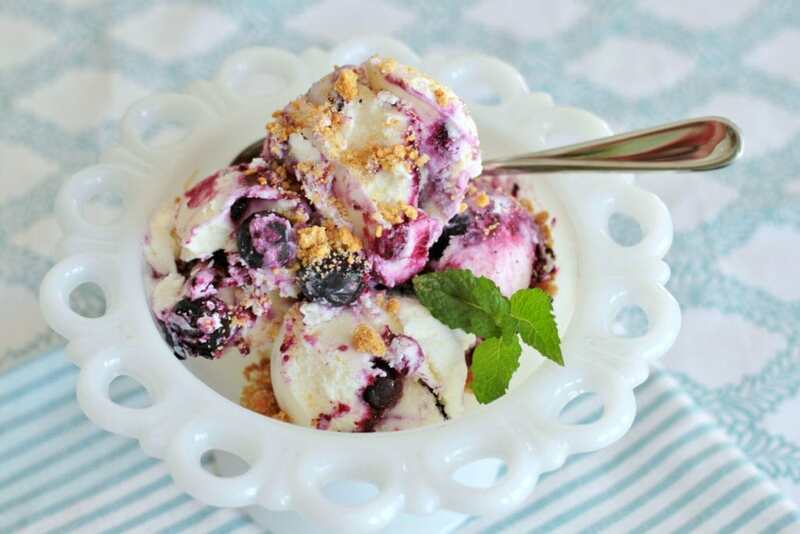 Can you believe that the whole Summer month of July has been designated ‘Ice Cream Month’? 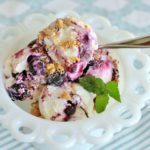 I don’t know who decides which foods need to be celebrated and when but July is certainly a great time (in the Northern Hemisphere) to make this home-made frozen treat. I had been wanting an ice cream maker for quite some time when I finally broke down and bought one. Sadly it sat in the basement, un-used and gathering dust for quite a while. Finally I saw an irresistible photo of ‘Balsamic Strawberry Ice Cream’ and I just had to try it out for myself. It may or may not have been beginners luck when it turned out so well. It was so delicious I’ve been dreaming of making it ever since (I really should get on that!). 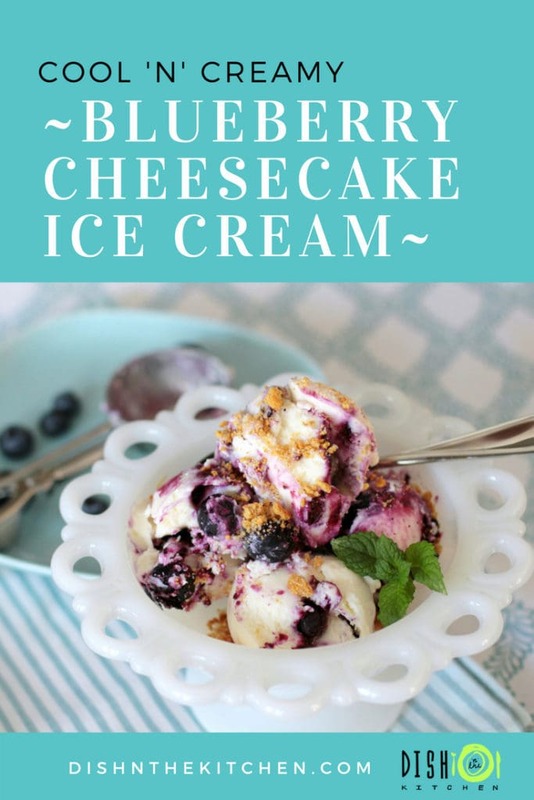 My newest frozen infatuation is this Blueberry Cheesecake Ice Cream recipe which was inspired by a recipe in David Lebovitz’s The Perfect Scoop. I am always keen to try any recipe (sweet or savoury) from Mr. Lebovitz because I find his recipes easy to follow and utterly delicious. I haven’t been disappointed yet!You know you’ve found a good thing when you actually avoided buying The Perfect Scoop because you’re pretty sure you couldn’t stop yourself from making all the recipes in the book! I swear to God that I am eating a bowl of this now as I type. It is so SO good and it really does taste like Blueberry Cheesecake. It is so good that kid number two who claims she doesn’t like blueberries heard my camera clicking for the ‘photo shoot’ and automatically came down stairs to see what I was shooting (Pavlov’s dog anyone?). She didn’t argue when I invited her to try it and subsequently went back up to her room with a bowl full of it. The blueberry hater has thus been converted! 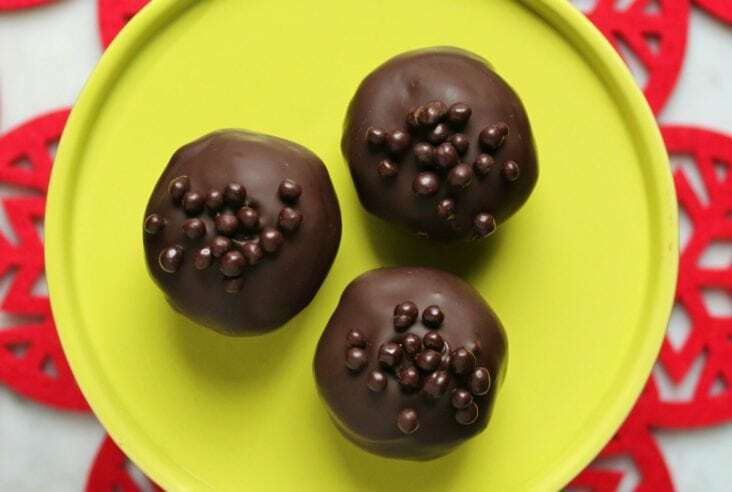 In case you are wondering, you could totally make this treat gluten-free by leaving out the graham cracker crumbs. 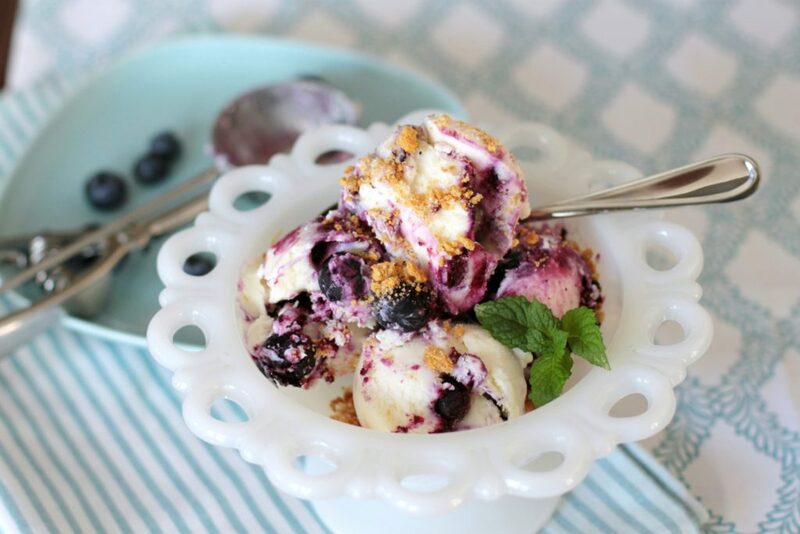 A satisfying frozen summer treat that combines Blueberry Cheesecake into a creamy Ice Cream. Bring out your bowls and spoons! Just grabbed up a couple of baskets of blueberries today – now this looks like an interesting thing to do with them! YES! Please give it a try. It was scrumptious. yes, it only makes 3 cups but it is VERY rich. The blueberries have a high water content so they do kinda screw up the texture a bit. I would definitely say the smaller blueberries would be better. the wild blueberries from our hike at Cheakamus would have been perfect; they were small and had a very intense flavour that makes the store-bought ones taste watered down!